The following procedure describes how to register mobile apps under your account settings. While the number of mobile apps is unlimited, application quota consumption rules are enforced based on your account plan. Contact us if you have questions about your mobile account options. Access your Account settings from the CARTO Dashboard. Your profile information appears. Click API keys. 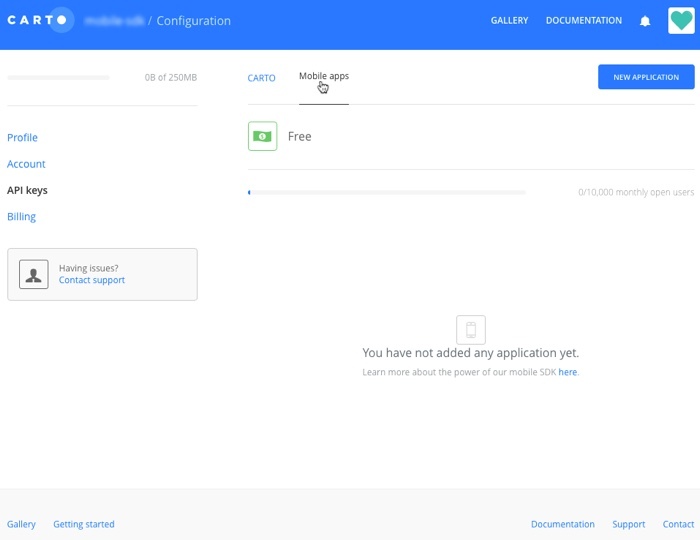 The API key page opens, displaying options for CARTO or Mobile Apps. Note: If this option is not visible from your account settings, contact us to ensure that Mobile SDK features are enabled for your account. Click NEW APPLICATION The new application settings appear. Once a mobile application is saved, you cannot edit the Platform setting. As an alternative, you can delete the application and recreate it with new settings. When you select a Platform, the Application ID displays more details about what identifiers, or packages, are required. 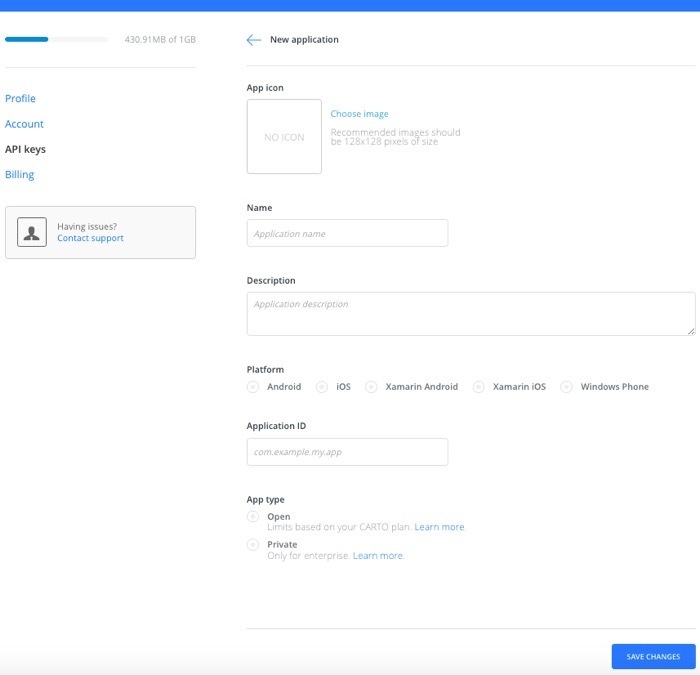 Application ID The identification of the mobile app in the App store that is required for development with the Mobile SDK. 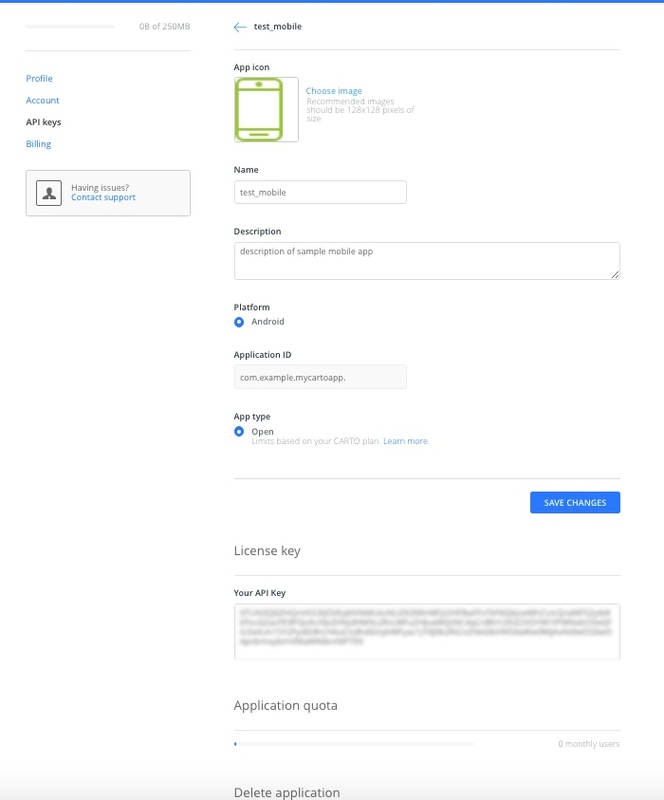 - Private: Available for Enterprise accounts only, allows organizations to publish their apps internally and have paid app use cases. Click SAVE CHANGES .The Mobile apps page refreshes, displaying the added mobile application and the features enabled. Once your mobile apps are registered for your account, you can retrieve the API Key for each application. This is useful when you need to copy and paste the API Key for mobile development. From the Mobile apps section of your API Keys, click a mobile application name. The application settings appear, and include the license key and amount of quota for the application. 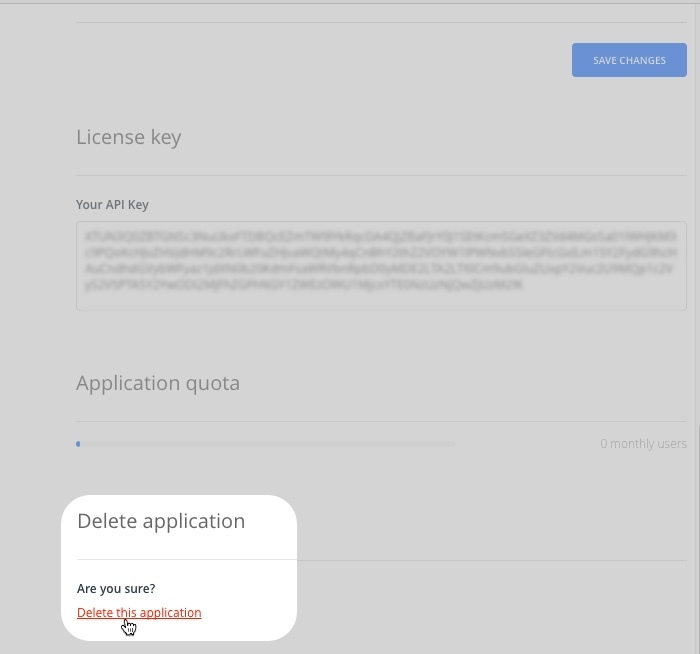 Copy the API Key from the License key section. 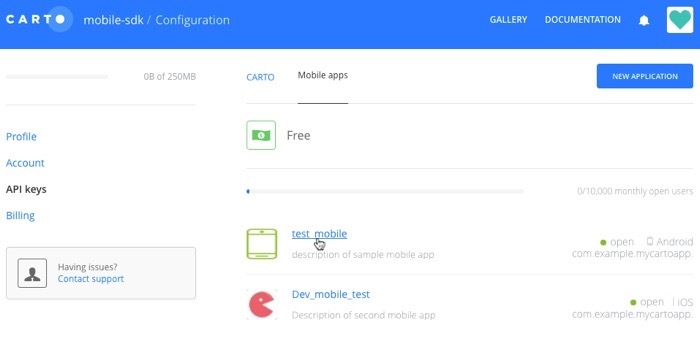 The following example displays the API Keys section for a selected mobile application. Note, the API Key in the example image is blurred out for privacy. Mobile App API Keys cannot be regenerated manually, but are automatically regenerated in the following scenarios. You will receive a notification when mobile api keys are regenerated.